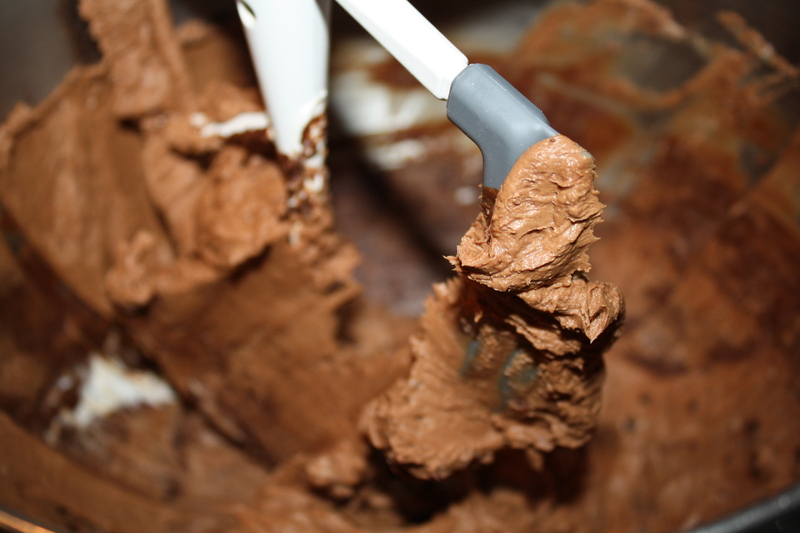 MIX graham cracker crumbs butter and sugar together in ungreased 9-inch springform pan; press firmly onto bottom. 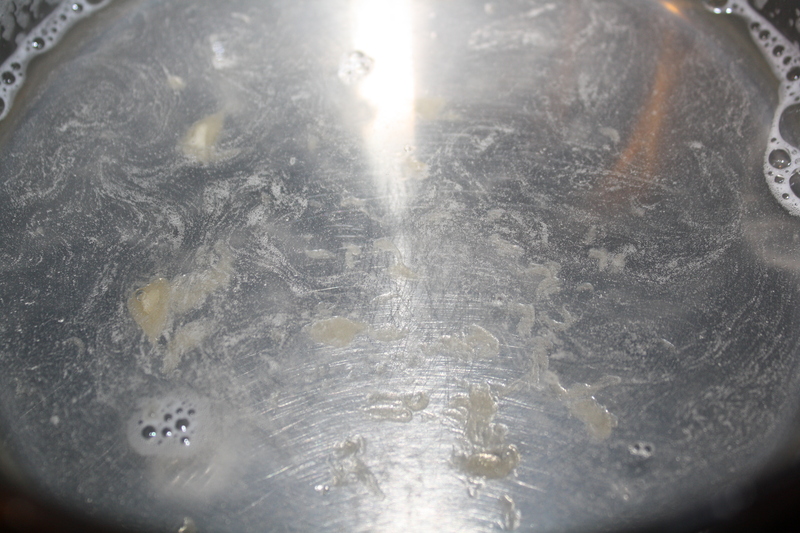 Sprinkle over water in small saucepan; let stand for 1 minute. Warm over low heat, stirring constantly, just until gelatine dissolves. Remove from heat. 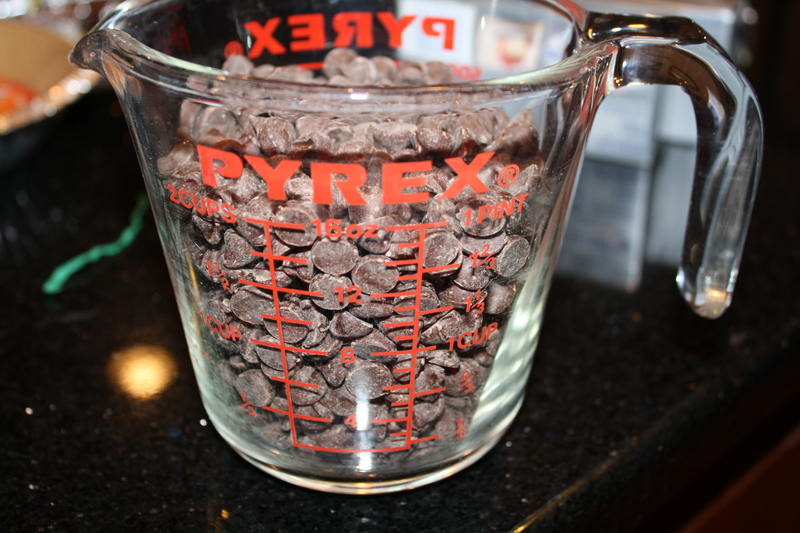 BEAT cream cheese and melted chocolate chips in large mixer bowl until fluffy. 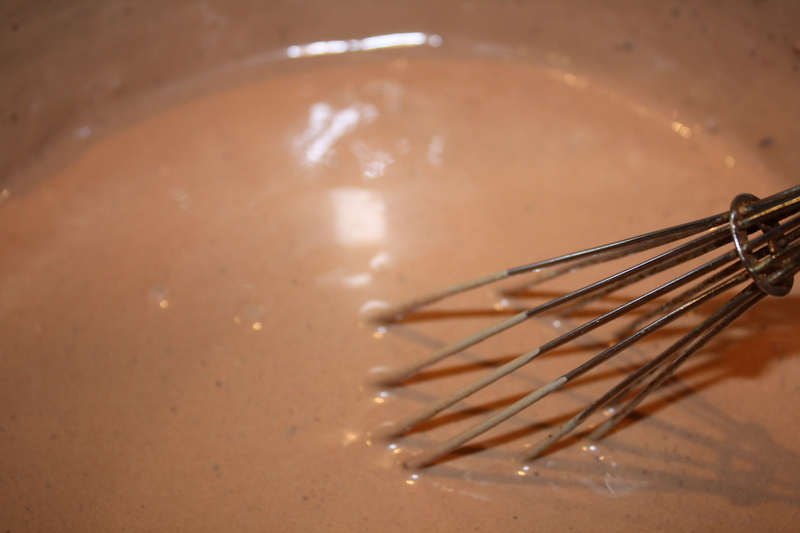 Gradually beat in sweetened condensed milk. 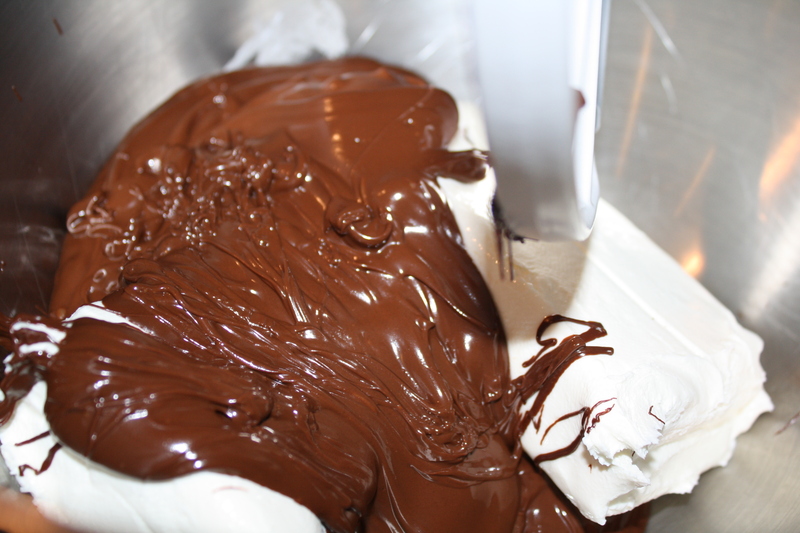 Stir in gelatine mixture; fold in whipped cream. Pour into prepared pan. Refrigerate for about 3 hours or until set. Run knife around edge of cheesecake; remove side of springform pan. *Follow melting directions on NESTLE package. 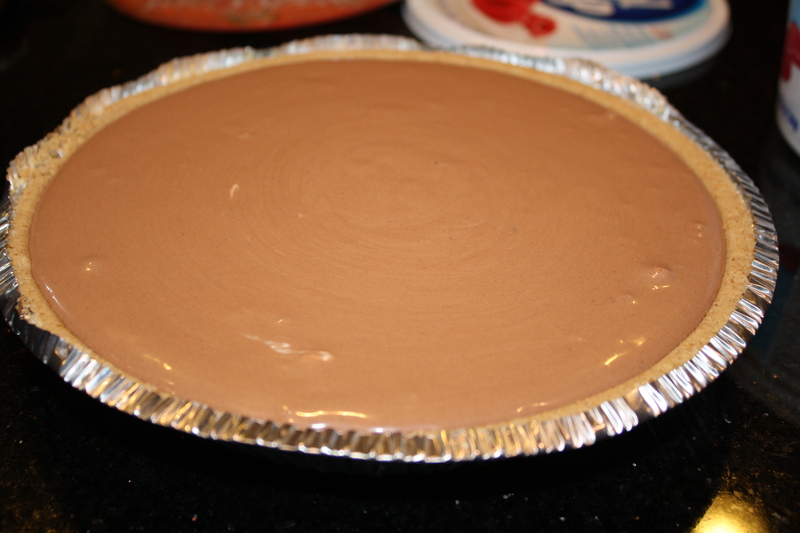 NOTE: 2 prepared 9-inch (9 ounces each) graham cracker crusts can be substituted for the 9-inch springform crust. Divide filling evenly; refrigerate as above. 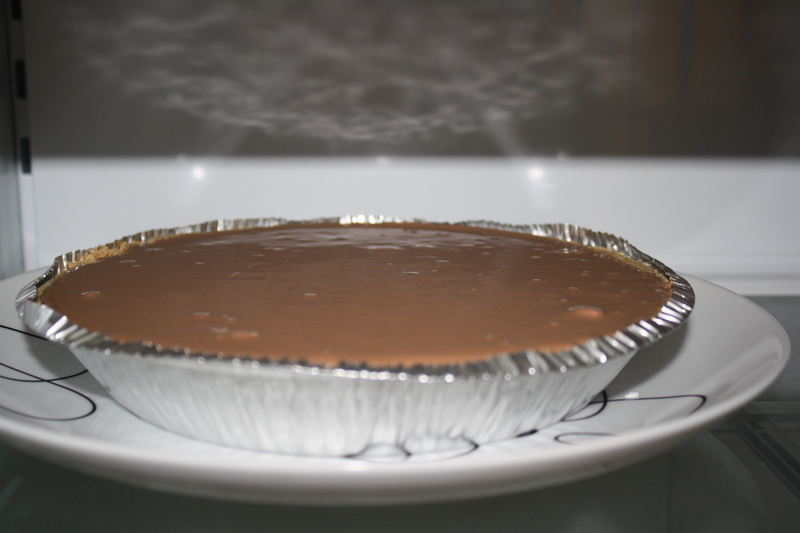 I some a ready-made graham cracker pie crusts, so I started with dissolving the gelatin in a saucepan. I wasn’t quite sure how much water to add though. I went with a cup. 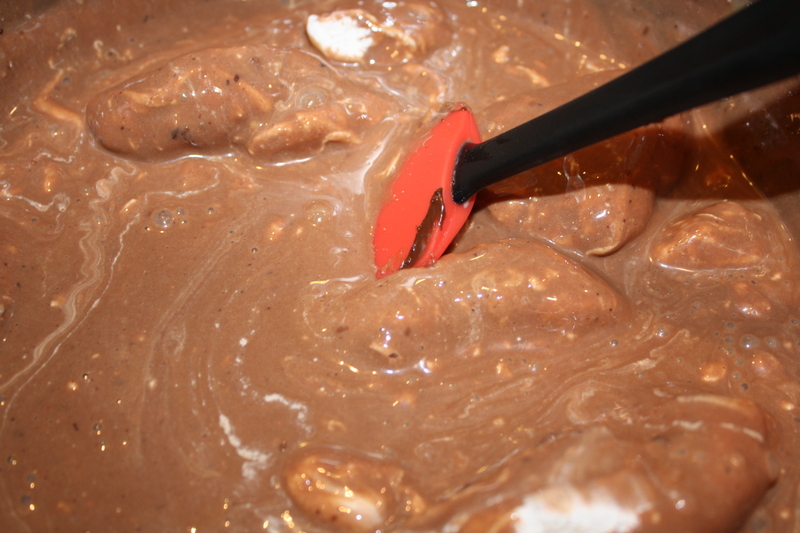 and added it them to the cream cheese, mixing them together until they were blended. 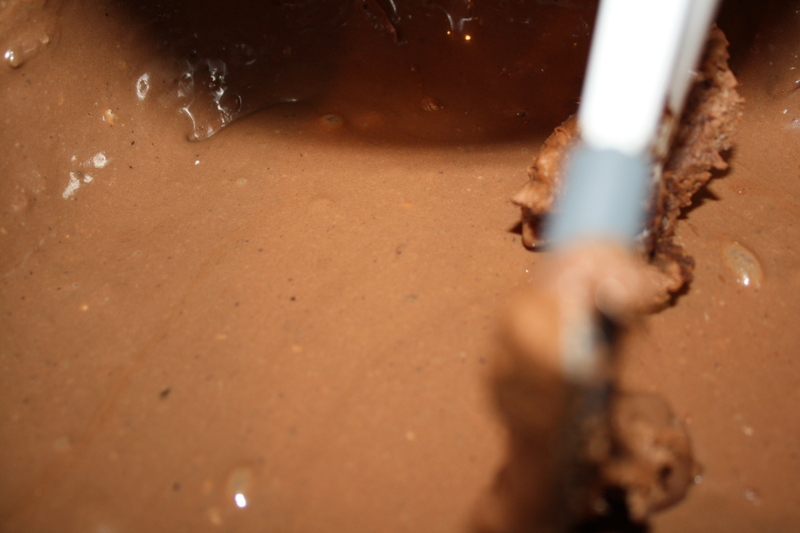 After the gelatin had cooled a bit, it was added to the chocolate mixture. I also gradually added the condensed milk here. Combine sugar and dry milk. Add warm water and mix well. Warm the milk in the top of a double boiler (a metal mixing bowl can be placed over boiling water in a medium saucepan for this purpose). Stir mixture until the sugar has dissolved. And then the whipped cream was folded in. 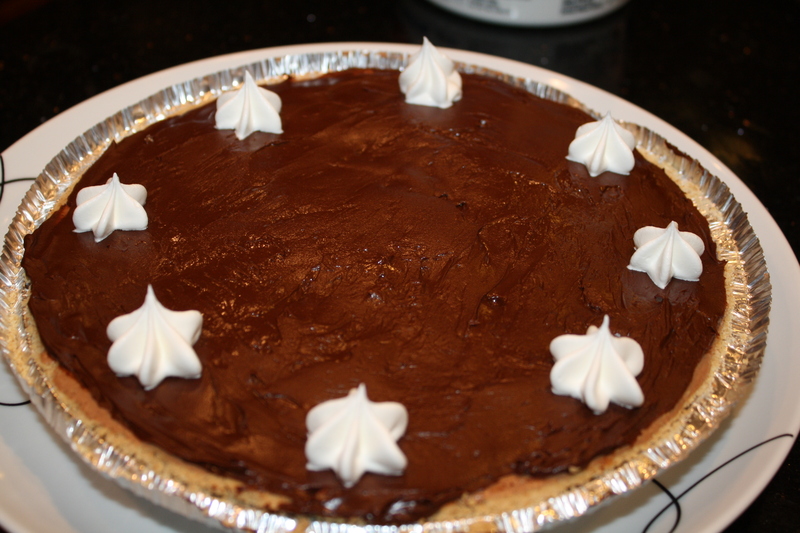 I was feeling lazy, so instead of whipping my own cream, I used some Cool Whip. and set to chill in the refrigerator for about three hours. 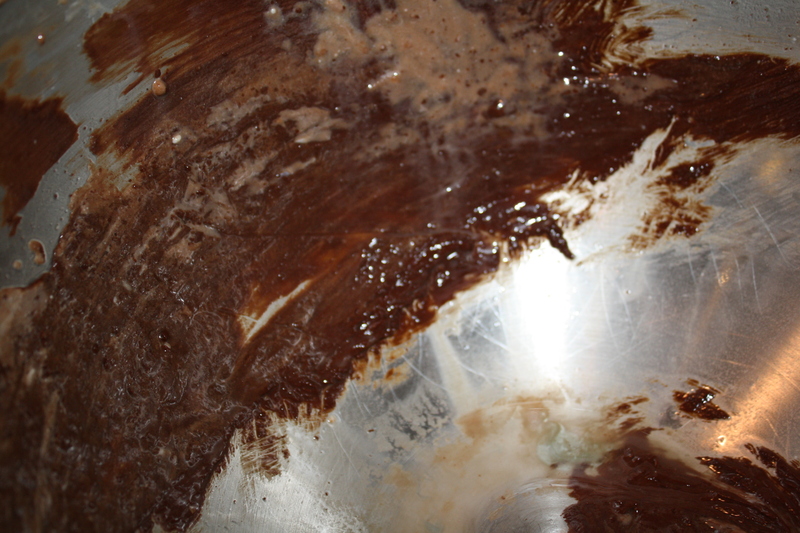 That left me to deal with a pretty messy mixing bowl, as the chocolate chips had hardened to the metal as they cooled. 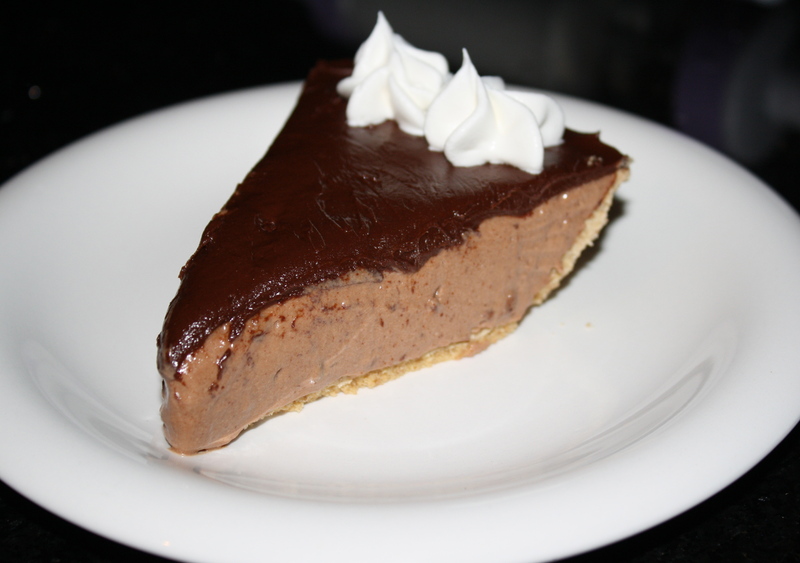 When it came out, it looked a little light, so I decided to put a topping of chocolate on it. For this I used a recipe similar to the copycat Magic Shell from a while ago. This was spread thinly in an even layer over the top of the cheesecake, and I used a little more Cool Whip for decoration. The result was a decadent, rich cheesecake. It’s a little softer than baked cheesecake, almost like a cream pie. 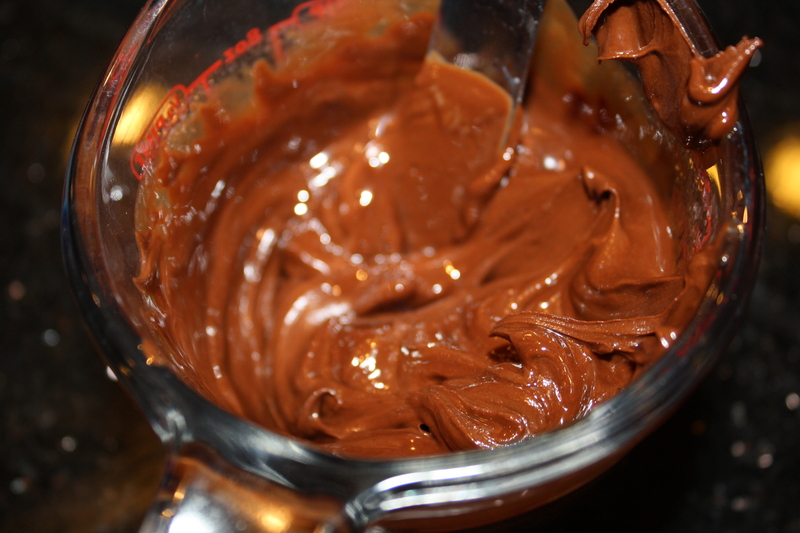 Not sure if that is because I used too much water in the gelatin or not, but still, I hope someone comes over to finish this today because if not, I’m going to start to look like Mario Batali (though my beard will be made of chocolate).